Metastasio’s libretto Siroe, re di Persia is based loosely on the life of the Persian King Khosrau II, whose aggressive empirical wars against neighbouring kingdoms briefly earned him the nickname ‘Parviz’ (‘the unbeatable’) until his eventual fall proved otherwise. He hoped to promote his younger son Medarza to the throne instead of his older son Shiruya, whom he imprisoned for treason; conspirators liberated Shiruya, crowned him king, and only a few days later he executed his father and 18 of his brothers (including Medarza). Metastasio transformed the story to create a more idealised dramatic context to explore the morals of filial respect, political duty, virtuous kingship and how these can be compromised by the conflicting passions of love, lust and envy. 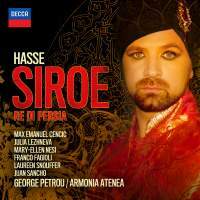 Hasse first set Siroe for Bologna in 1733 but this recording is based on a different version prepared in 1763 for the court opera in Dresden and Warsaw (Elector Augustus III of Saxony was also the King of Poland). Two-thirds of the arias were completely rewritten, including all of those for the title-hero. For this recording, a small amount of material by Handel and Graun is interpolated into Act 3 (the reason is unexplained). George Petrou achieves an elusive dichotomy of orchestral delicacy and theatrical pace. Reams of recitatives crackle with dramatic conviction. Max Emanuel Cencic’s impassioned performance of Siroe’s first aria ‘La sorte mia tiranna’, with its shaded contrasts between pathos and heroic resolve, long-spun melodic cantilena, and subtle colourings from horns, flutes and oboes, indicates how much Hasse’s style influenced the ‘Classical’ generation (including the child Mozart). Franco Fagioli is aptly cast as Siroe’s evil little brother Medarse, whose elaborate showpiece at the end of Act 1 has neither room nor desire for subtlety and takes no prisoners (‘Fra l’orror della tempesta’). Julia Lezhneva’s sparkling coloratura is utilised to serve the dramatic sentiments of Laodice’s vengeful ‘O placido il mare’ (sung after her unwanted advances have been spurned by Siroe), and later on her apologetic ‘Mi lagnerò tacendo’ trips along limpidly. Emira’s path to happiness is far from smooth because her father was killed in battle by her beloved Siroe’s father; Mary-Ellen Nesi’s unleashing of the pent-up anger at Cosroe in a chain of accompanied recitatives culminates thrillingly with the enraged ‘Che furia, che mostro’. Juan Sancho’s changeable tyrant excels equally at tyrannical rage (Cosroe threatening his son in ‘Tu di pietar mi spogli’) and bitter self-reproach upon realising his mistake too late (‘Gelido in ogni vena’). Parnassus Productions earns kudos for its adventurous ambition to record a complete Hasse opera to such a high standard – even if Decca’s retro-style cover of the big star dressed-up in costume is cringeworthy.